, which is lowering patient Marine Sgt. Harry Morse, into water. In background, left, Murray Wiltshire, IC3, relaxes on submerged board. At right, Seaman William J. Flynn, on exercise platform, receives treatment from H/M3 Tom Baltes. 18: Robert Cano, TE3, has skin-graft on arm, in whirlpool for therapy treatment from Nurse Lt. Elaine Galles. 19: Assistants load pies on wagon for distribution on trays of patients. 21-22: Assembly line method of preparing trays for bed patients. At left, fish is placed on belt. As belt moves dish along, each attendant places a meat or vegetable on it. At right, it is sealed with a cover to keep it warm. Then it is placed on a tray with balance of meal and sent to the patient. 23-24-25: L to R: Commanding Officer Capt. A.B. Chesser, and Admin. Officer Lt. 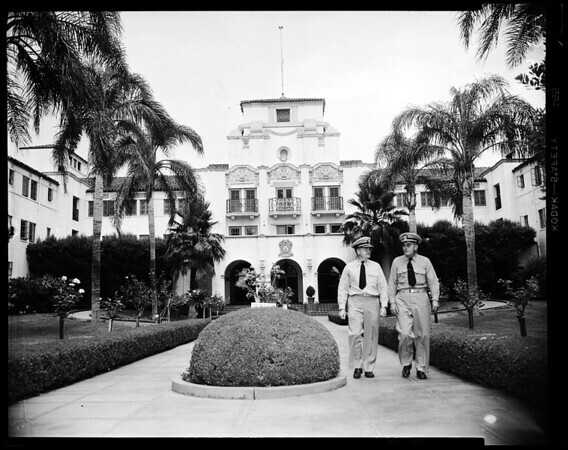 Commander J.P. Smith, in front of main hospital bldg. ".